During 2008, Miami Marlins baseball team owner, Jeffrey Loria, challenged his organization to “Go for the Gold” when planning to build the new Marlins Park. In response, the baseball organization chose to pursue Leadership in Energy and Environmental Design (LEED) Gold, rather than LEED Silver. It would be the first facility to have a retractable roof in the world to achieve LEED Gold. “It was our desire from the onset to not only build America’s greatest new ballpark, but also its most environmentally friendly,” said Loria of the goal to reach Gold. Every credit was critical to the Marlins reaching the minimum of 60 points required to achieve LEED Gold. With this in mind, the organization began the process of engaging a commissioning team. A strategy the Marlins employed was to commission the stadium within the LEED standards of Energy and Atmosphere (EA) prerequisite 1 and EA credit 3 for Enhanced Commissioning under LEED v2.2. Terracon played a major role in this strategy by providing the Marlins with Building Enclosure Commissioning (BECx) as part of the entire building commissioning process. Terracon’s BECx services span the life of a project, from pre-design programming through the warranty phase. Critical components include design reviews, construction observation documentation, and functional performance testing of the building enclosure systems. In addition to being a valuable service to owners for improving the efficiency and sustainability of a building’s enclosure, BECx is extremely important in the pursuit of LEED certification. It has a direct impact on several LEED credits, as well as an indirect impact on many others. Through work on the Marlins Park and many other projects, Terracon has fine-tuned the process by which BECx can be accomplished in a manner that is acceptable for LEED certification. By working with the Green Building Certification Institute (GBCI) and going through the appeals process on several projects, Terracon narrowed down the requirements for achieving the previously available ID credit to what is now very similar to the requirements for EAc1 Option 2 BECx for LEED v4. Terracon’s commissioning services have proven resourceful by developing ways to achieve the challenging Innovation in Design (ID) credit that greatly aided pursuit of LEED Gold under previous LEED versions. Terracon turned to industry standards in order to achieve this credit. With the knowledge of various guidelines for building enclosure consulting and a thorough understanding of ASHRAE Guideline 0: The Commissioning Process, Terracon has been able to develop project specific building enclosure commissioning goals around the strict requirements for building energy systems commissioning. Under the current LEED version 4 (v4), standards such as the recent publication of the National Institute of Building Sciences (NIBS) Guideline III and ASTM Standard E2813 for BECx are referenced and available where they were not for past projects. BECx is now also an available option for achieving the credit for LEED v4 EAc1 Enhanced Commissioning, where it was only available for an ID credit in previous versions. The entire commissioning process starts by setting a strong “foundation” for the project prior to design and during the development of the Owner’s Project Requirements (OPR). Like a building’s foundation, the OPR establishes a base and sets the tone for a project giving it a basic structure by which all parties, from architect to subcontractors, must abide. It is during the OPR process that the BECx agent defines the way a building enclosure will be commissioned for the owner with a commissioning plan that fits within the boundaries of the Basis of Design. Terracon begins the process of collaboration and project integration by engaging the project architect in review of building enclosure Design Development Phase document details, components, and materials. 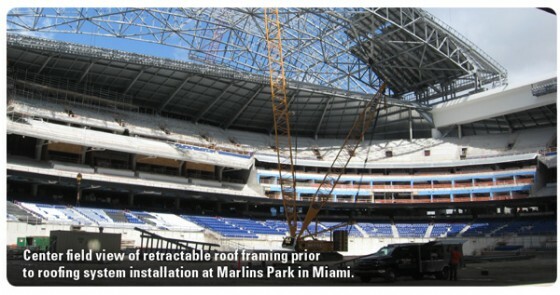 As the building enclosure commissioning agent for the Marlins, Terracon began by reviewing the OPRs set by the team and their architect, and refined basic systems selections that included the cladding type and roof assembly. BECx also star ts with foundations, literally. A BECx kick-off meeting is often held in coordination with the installation of below-grade waterproofing of the foundation. All relevant subcontractors and trades attend the kickoff meeting to ensure full project integration and collaboration during the construction process. Terracon also makes intermittent site visits throughout the course of the project to verify that construction of the facility is in general accordance with the construction documents. Upon completion of each enclosure system installation, a functional performance test is executed to demonstrate the ability of each system to withstand simulated climate-specific weather conditions. It is during the construction document review process that Terracon begins to develop functional performance test requirements for the building enclosure systems that will be executed after installation of each individual system. Upon completion of the functional performance tests, Terracon provides the owner with an operations and maintenance schedule for each enclosure system that covers the estimated useful life of each component. Examples of enclosure systems maintenance for Marlins Park included cleaning the thermoplastic polyolefin roof membrane every six months to avoid microbial growth and completing an annual roof survey to extend the life of the membrane. 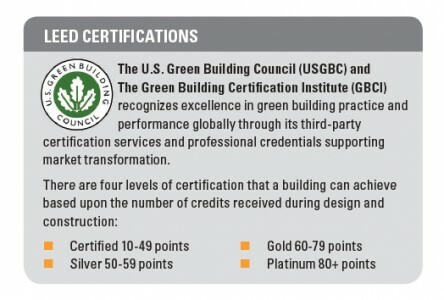 It is only through a complete understanding of LEED certification, whole building commissioning, and industry standards that Terracon is able to provide a deliverable to the GBCI that has previously achieved the ID credit for BECx and now meets the requirements for EAc1 Option 2 under LEED v4. Like the Marlins organization meeting the challenge to “Go for the Gold” LEED certification of the new ballpark, other companies and agencies can also strive for the same goal by utilizing these BECx strategies. This article originally appeared in Civil + Structural Engineer Magazine, August 2014 Vol. 1 Issue 5, “Going for the (LEED) Gold: Miami Marlins Park”: http://cenews.com/article/9839/going-for-the-leed-gold-miami-marlins-park.